In its latest assessment of the global economy, the International Monetary Fund (IMF) revised down their forecast for global growth to 3.1% in 2016, and to 3.4% in 2017, reflecting a more subdued outlook for advanced economies following the UK’s vote in favour of leaving the EU (Brexit) and weaker-than- expected growth in the US. These developments put further downward pressure on global interest rates, with monetary policy expected to remain accommodative for longer. Financial sentiment toward emerging market economies improved with the prospect of lower interest rates, less concern about China’s near-term outlook following policy support to growth and some firming of commodity prices. But prospects differ sharply with emerging Asia in general and India in particular showing robust growth and sub-Saharan Africa experiencing a sharp slowdown. In advanced economies, uncertainty about institutional and trade arrangements post Brexit and downside risks may fuel further political discontent, with anti-integration policy platforms in the EU and the US gaining more traction, while several emerging and developing economies face daunting policy challenges in adjusting to weaker commodity prices, making the need for a broad-based policy response to raise growth more urgent. Despite low crop prices and challenging weather conditions, global wheat, rice, coarse grain and oilseed crops, are expected to produce a bumper global harvest of almost 3.1bn/t in 2016, over 100mt (million tonnes) more than last year reflecting strong gains in yields, especially US corn yields, boosting global stocks to record levels, and those in major exporting countries (except France where wheat output and quality, significantly downgraded), while exerting downward pressure on crop prices. The global stocks-to-use ratio is expected to remain relatively high for the main cereals, preventing crop prices from improving significantly in 2016/17. The UN’s Food and Agricultural Organization (FAO), expects global food markets to remain “generally well balanced” in the year ahead, seeing prices for most internationally-traded agricultural commodities as relatively low and stable. The eradication of hunger and the promotion of sustainable agriculture are the key objectives of the UN’s 2030 Agenda, but higher temperatures and erratic weather patterns, are putting these goals at risk and undermining the health of soils, forests and oceans on which agricultural sectors and food security depend. The FAO, in recognizing that many of the World’s poorest have been hit-hardest by higher temperatures and by the increasing frequency in weather-related disasters, raised the issue on World Food Day 2016 through the message, “Climate is changing. Food and agriculture must too.” The FAO’s Director- General, Jose´ Graziano da Silva, confirmed that the global food South Asia and Latin America, especially in Argentina, with the removal of export taxes on corn, but unlikely to fully recover in Brazil. With the downturn in the global economy, major players like Monsanto, Syngenta, Bayer, DuPont, Dow chemical and BASF, who control almost two-thirds of the global seed market, having bought-out a number of independent seed companies, find themselves caught-up in a wave of mergers and acquisitions, as a result of falling profits and lower sales to farmers. Dow chemical and DuPont announced a $130bn merger last year; while Bayer AG and Monsanto agreed to a $57bn merger; ChemChina is pursuing a $44bn take-over of Syngenta; the deal was approved by the US Committee on Foreign Investment, before it was known that ChemChina and Sinochem, China’s leading fertilizer company were holding merger talks to create a chemical giant worth $100bn. Potash Corp the largest potash company in the world and its former smaller rival Agrium are expected to merge creating a $36bn fertilizer company and Vale SA plans to, dispose of its fertilizer assets to Mosaic and Yara International ASA. While, Louis Dreyfus like some of its trading peers, plans to sell its African fertilizer business and bolster fertilizer activities with joint venture partners, in South America and Australia. EU Commission could block its takeover by ChemChina, while Chuck Grassley chairman of the US Senate’s Judiciary Committee has called a hearing so that federal regulators can consider the implications of the ‘seismic shift’ the proposed mergers are likely to have on agriculture, farmers and consumers. According to Farm Journal research, should the deals between Bayer/Monsanto, Dow/DuPont and Syngenta/ChemChina, receive approval, it would leave more of the market in even fewer hands, some 82% of the corn seed market and 76% of the soybean market. Nutrient application, which had been on a rising trend, remains constrained due to low farmers’ profitability. But there has been a modest increase in some crop prices which, along with depreciating currencies in some key exporters, may provide some relief. While fertilizer prices are expected to decline by 22% in 2016 due to weak demand, high stocks, and rising supply capacity, they are generally expected to increase moderately over the medium term due to expected growth in demand and higher energy costs. Risks include weak demand and new production capacity, while higher agriculture prices or currency appreciation could boost fertilizer demand and prices. advanced, on a similar area to last year, despite record-high global wheat stocks of 248mt and lower international prices. Overall conditions are reported by the International Grains Council (IGC) to be “mixed”, with “dryness in parts of Europe, Ukraine and Russia contrasting with wet conditions across the US Plains”. In the EU, plantings will be broadly unchanged and despite some concern of dry soil conditions in areas like the Black Sea, the planted area is unlikely to change, as grower margins are shielded by currency weakness of commodities, such as wheat, which are traded internationally in dollars. In the US there is some concern that hard wheat plantings will be reduced, but difficult to see global output of wheat lower in 2017, given the planted area, unless a significant weather disruption occurs. Mid-October wheat offers from major exporters included US $174/t, Russia $178/t, Romania $180/t. Average prices FOB Gulf US No 2 HRW $192/t (25 Oct ’16). Soybean plantings are off to a better start In Brazil, compared to last year when hot and dry conditions delayed planting. The weather in southern Brazil became very wet in October, with more rain forecast, by contrast central Brazil, was hot and dry, generally dryer-than-normal. USDA’s provisional estimate for Brazil’s soybean output is forecast at 102mt. Tight domestic supplies of corn in Brazil, following last year’s dismal harvest have supported an increase in values of 34% year- on-year, according to Cepea. “A shortage of corn has led to high prices,” said Stefan Vogel, head of agri commodity markets research at Rabobank, meaning that farmers will “continue to plant corn”. IGC forecast Brazil’s corn plantings to rise by 3% for 2016/17, while USDA forecast the corn crop at 83.5mt. Argentine President, Maurico Macri made good on election pledges by scrapping export taxes on wheat and corn, which led to an increase in corn and wheat plantings last year at the expense of soybeans, which seems set to continue this year. Monsanto’s surprise quarterly profit predicted rising earnings ahead, backed-up by a potential surge in Argentine corn sowings forecast to rise by 23% 2016/17. Dr Michael Cordonnier also expects corn plantings to rise by 25% and possibly higher by 100–200,000 acres, due to the government's change of view on the soybean export tax. While a 5% cut in the export tax down to 25% has been introduced, it will only apply to ten northern states, that produce less than 10% of Argentina’s soy, disappointing farmers in other areas, who hoped lower tariffs, would boost exports. Buenos Aires Grain Exchange forecast soybean plantings to decline from 20.1m/ha to 19.6m/ha (48.4m/acre) in 2016/17, with production at 53mt, while USDA forecast Argentine soybean production at 57mt. Private analysts Informa forecasts US soybean plantings at 88.5m/acres provisionally an all-time high, while US corn plantings were expected lower at just under 91m/acres in 2017. Last year US farmers planted 94.5 m/acres of corn and a record 83.7m/acres of soybeans, according to the USDA. The global corn crop forecast 1,026mt in 2016, includes a huge US corn crop of 383mt currently being harvested; despite large supplies corn futures rallied on firm US export sales data, CBOT Corn Futures Dec ‘16 closed up at $3.52/bu (21 Oct ’16)-Corn 3YC FOB US Gulf $164/t (20 Oct ’16). Norwegian based Yara International ASA, revealed in its third quarter results that weak fertilizer prices had hit profits but by less than investors had expected. But that long-term “oversupply” in the nitrogen sector, exacerbated by output increases in countries such as Algeria, Egypt and the US, resulted in steep falls in nitrogen values, that even some Chinese producers are struggling, increased coal prices adding to cost pressures. According to Yara’s CEO Svein Tore Holsether, export prices of about $200/t “appear to represent a break‐even level for high‐cost Chinese producers,” prices, as measured in the key Black Sea market, averaged $183/t in the July-to-September quarter, falling 32% year-on-year. He confirmed that oversupply would be a permanent feature of the sector for some time, with ongoing urea capacity in the US and North Africa displacing Chinese urea exports leading to structurally lower prices in most locations, with more to come from fresh capacity, resulting from the fracking wave in North America, which has released large supplies of low-priced gas. New ammonia plants have come on stream in Russia, Saudi Arabia and in the US. The weak prices and large supply prospects underline the need for rationalization to respond to the changing dynamics. The IFA forecast global ammonia capacity to rise by 10% to 230mt NH3 in 2020, with large increases expected in Africa, North America and EECA. For the first time in ten years, capacity in East Asia will show virtually no net growth, due to the removal of almost 15mt of capacity in China. Elsewhere, new plants are expected to come on stream in Russia, Saudi Arabia and the US. Future nitrogen demand is anticipated in Latin America, South Asia and Oceania suggesting growing import demand for nitrogen products in all forms. With supply exceeding demand up to 2020, the IFA expect regional surpluses accumulating in Africa, EECA and to a lesser extent West Asia. The average price of ammonia continued its downward trend. Commodity market slowdown, lower fertilizer use, and increased capacity triggered the decline. While it was anticipated that nitrogen fertilizer prices were expected to decline as new capacity expansions at CF Industries Inc and other producers come on line in 2016 and 2017, low prices over the past several months have persisted far longer than previously anticipated. Additionally, the retail market has reportedly greatly reduced inventories due to the potential price risk and likely to operate in a similar manner into the spring of 2017. The negative impact of weaker prices and volumes prompted Moody's Investors Service to downgrade CF Industries Inc ratings. Urea capacity, with the exception of China, is expected to rise over the next five years, by 10% to 229mt with Africa, North America and EECA accounting for 70%, of the increase. Global supply is forecast to grow by 2.5% per annum to 208mt with demand for all uses to rise by 2% per annum to 192mt; Latin America and South Asia accounting for almost half of the increased demand, with large potential surpluses to persist reaching 8% of supply by 2020. Urea prices dropped 8% in July, reaching the lowest level in 12 years before briefly rising in August, strong international demand especially in Brazil and supply outages helped support prices. At the Gulf spot urea prices have remained below $200/t since early June and following a brief rise in August near $200/t fell to $189/t in October. Without major improvement in crop prices growers around the world may be hard-pressed to justify expansion, but the strong dollar is weakening many currencies, raising local farm prices for foreign farmers though they will pay more for inputs. Urea fertilizers account for more than two-fifths of total global nutrient consumption. Its demand profile is more stable than other nutrients because it is typically applied every year at stable rates. The market continues to be impacted by new capacity and low input prices (natural gas globally, coal in China), although coal prices rose during the quarter following supply tightness. The urea market is expected to remain oversupplied and capacity to grow in a number of countries, including the US, where imports are likely to contract sharply and further bloat seaborne supply. Potash prices plunged 16% owing to weak demand, high stocks, and ample supply. Prices are improving in response to tighter supplies from Canadian producers, to stem the oversupply and help the market recovery from the nine-year low posted in August. Demand has been weak, in part because farmers can defer application without a significant loss to yield and quality, unlike nitrogen application. New contracts signed with India and China in June/July following sharply lower prices are expected to limit the downward trend, but global demand is due to contract this year. The IFA forecast global potash capacity to expand by 22% to 64.5mt K20 in 2020, due to a combination of less expensive brownfield projects in a number of countries and six new mines to come on stream with projects in Canada, Russia,Turkmenistan and Belarus to account for over two-thirds of the increase in supply rising to 51.6mt K20. North America would account for 34 % of global supply, EECA 33%, East Asia 15%, and other regions 18%. Global demand for potassium for all uses would rise by 11% to 43mt K20. The market is expected to remain over-supplied with new capacity coming online over the next few years, resulting in a growing surplus. Given the ongoing difficulties for fertilizer manufacturers, faced with weak demand and sharply lower prices-potash, nitrogen and phosphates, well below their five- and ten-year averages, prompted producers in several countries to undertake a activities to reduce costs and improve efficiency, across the nutrient sector. Recent merger talks between Canada’s Potash Corp. of Saskatchewan the world’s largest producer of the fertilizer by capacity and smaller rival Agrium, culminated in a deal expected to be put to the respective shareholders on 3 November. If approved, the new company, worth $36bn, would be the world’s largest potash producer and the third biggest nitrogen and phosphorus manufacturer. Potash price movement was broadly positive mid-October in the US Corn Belt region, average weekly granular potash prices rose to $221/t. Similarly, average weekly prices in Brazil rose 1.3% to $237/t, prices at Vancouver $215/t, while the standard MOP prices in Southeast Asia rose to $242/t. 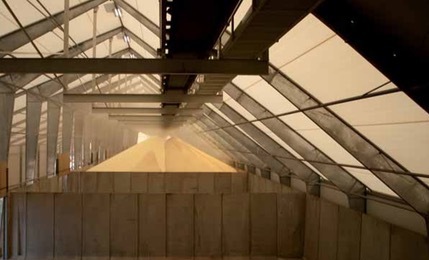 Recently positive moves in potash prices generated optimism about the outlook for potash producers including Intrepid Potash (IPI) and Israel Chemicals (ICL), that have faced severe weakness in the market this year. Institutional Shareholder Services (ISS) an investor advisory company recommended that investors in fertilizer producers Agrium Inc. and Potash Corp of Saskatchewan support the tie-up that would create a new company with significant leverage. The $36bn deal combines Potash Corp’s large nutrient production capacity with Agrium's large North American farm retail network. PotashCorp’s shareholders would own 52% of the new company. Global phosphate rock supply would grow 11% compared with 2015, to reach 250mt of phosphate concentrate in 2020, with Africa, Saudi Arabia and China accounting for three-fifths of this 25mt increase. Global phosphoric acid capacity in 2020 is projected to expand by 13% to 65.3mt P2O5 in 2020. Large capacity additions would occur in Morocco, China and Saudi Arabia. The IFA forecast global supply of phosphoric acid would increase by 2.4% per annum to 51.9mt P2O5, while demand would grow at 2.5% per annum to 46.2mt P2O5 pointing to a stable potential surplus between 2015 and 2017 and moderate increase towards 2020. Over the next five years, global capacity for the key processed phosphate fertilizers (mainly export orientated), would grow by 7mt P2O5 to 52mt P2O5 by 2020. Three exporting countries (Morocco, Saudi Arabia and China) would account for the bulk of the increase. During the third quarter DAP prices fell by 3% and TSP by less than 1% due to oversupply and weak demand in India, which continued to weigh on these markets. Although demand has been strong in South America this year, India’s imports for the current fertilizer year, from April, are down by 25%. The reasons include high stocks, weaker than-expected monsoon, rising domestic production and government policy delays on nutrient subsidies and maximum retail prices. Markets are expected to remain oversupplied, with supply pressures as new capacity expected from Morocco in December and Saudi Arabia in 2017. For India, which houses one-third of the world’s poor, inflation control will always be accorded high priority, writes Kunal Bose. A major challenge for the government is to see that food prices even when production suffers due to adverse weather condition do not go out of the reach of common man. In a situation where out of 141m hectares of net cultivated area only 46% has the benefit of irrigation, the supply side dependence on the monsoon for food items remains perennially critical. Precisely because of the farm sector’s dependence on monsoon rains, growth rates in Indian agriculture in the past three years fluctuated between 1.5% in 2012/13 and 1.1% in 2015/16. Thanks to severe drought in many parts of the country, farm and allied sector had a negative growth of 0.2% in 2014/15. Fortunately, after two year of scanty rains left cultivable land parched in many parts of the country, India had normal north- west monsoon this time allowing farmers to grow monsoon food and cash crops such as rice, soybeans, sugarcane and cotton and jute in land that is nearly 4.5% more than last five year’s average. The official first advanced estimate of monsoon foodgrains production is a record 135mt (million tonnes). It is also likely that because of the moisture left in growing fields and expectation of adequate precipitation during the winter, production of wheat and several oilseeds will too be good. Hopefully, adequately buffeted by rains India will have a farm growth rate of 4% in the current year. The Planning Commission, which has now been replaced by Niti Aayog (National Institution for Transforming India) says the country will have food security only if agricultural production has a sustainable compound annual growth rate (CAGR) of 4%. For the administration, the formidability of challenge of providing food goes beyond short and medium term to 2030 and further when it will have to provide food, nutrition and water to more than 1.5bn people. India is already under considerable stress given the fact that though it has 17% of the world population it has ownership of only the globe’s 2.4% of land, 4% water and 1% forest resources. In the face of pressure to produce food and other crops on a growing scale, India unfortunately has been found wanting in arresting depletion of soil quality. This is happening because of highly skewed use of nitrogen (N) at the expense of phosphorous (P) and potassium (K). According to official sources, urea that is N dominates the fertilizer sector, it is having 86% share in the total production of all nutrients. It is also the most imported and most consumed with 74% share of all fertilizers in use. The kind of damage an ill- conceived subsidy on an agricultural input could do to the sector and the environment is best illustrated by urea, which alone accounts for nearly 70% of fertilizer subsidy. Dwelling on the issue of high subsidy and the government fixing a controlled maximum retail price (MRP) leading farmers to overuse urea that in turn causes soil detriment, agricultural expert Om Prakash Dhanuka says:“For the sake of soil fertility, N, P and K should be ideally used in the ratio of 4:2:1. The government publication Economic Survey 2015–16 says the overuse of urea in India is pronounced compared with the US, the world and many Asian countries. We may draw some comfort from China exceeding India in the overuse of urea. Most Indian states use almost twice more urea as compared to phosphorous than is recommended. The overuse of urea vis-a`-vis potash is even more galling. Here a parallel may be drawn with Bangladesh where the use of N is about 5% more than K. In India the average use of N vis-a`-vis K is more than 100%. Unbelievable it will sound, but it is 4,500% more in Rajasthan and 1,300% higher in Punjab and Haryana. The big malaise in the farm sector linked to grossly unscientific use of N, P and K is due to the way fertilizer subsidy is administered. For some strange reason, the government reform of the fertilizer sector has stopped at diammonium phosphate (DAP) and muriate of potash (MOP), which unlike urea receive subsidy based on a formula that determines the amount of N, P and K in a given amount of nutrient. DAP and MOP receive a fixed per kg subsidy which does not change at whatever prices these fertilizers are sold in the market. Imports of DAP and MOP are not controlled in any way and here also the government only gives a nutrient based subsidy. The subsidy for the two fertilizers amounts to roughly 35% of their production costs. (i) Fixing a MRP at which the nutrient is to be sold to farmers. The domestic sale price is generally one-third the cost of imported fertilizer. (ii) Subsidy is given to 30-odd domestic producers on a unit specific cost plus basis. This means inefficient producers will not have the incentive to raise efficiency bar leading to cost cutting. (iii) Imports are canalized with only three agencies allowed to bring foreign origin urea. (iv) Finally, canalizing agencies are told by government agencies how much to import when and once imported urea arrives in which districts to sell. Fertilizer subsidy accounts for 0.8% of the country’s gross domestic product (GDP). The subsidy goals are: enabling poor and marginal farmers to use the nutrient in their fields and improve land productivity on a sustainable basis. Urea subsidy flies in the face of the principle of ‘one product one price.’ What the authors of urea subsidy have certainly not taken into account is that “products which are essentially the same should be charged the same price, else there will be incentives built in to divert the subsidized commodity from eligible to ineligible consumers.” This is exactly what is happening with urea on a very large scale depriving the targeted beneficiaries of supply and sustaining black market in a critical farm input. A comparison of urea allocation data with estimates of its actual use shows over 40% diversion of the nitrogenous fertilizer to chemical units and to markets beyond national boundaries. Two more occurrences should set the government seriously thinking about changing the urea subsidy formula without any loss of time. First, besides diversion to chemicals manufacturing units, much of the nutrient meant for small farmers and sharecroppers ends up with big landowners because of rampant unethical practices at retail points. Second, the operating subsidy formula is rewarding inefficient urea producers at the cost of the Exchequer. Dhanuka says “the solution to large-scale black-marketing in urea lies in bringing this nitrogenous fertilizer to nutrient-based subsidy that is working well for DAP and MOP. Let the subsidy for urea be based on nutrient found in a given amount of this fertilizer. Imports of urea will also have to be decanalized. Once the subsidy is fixed on the basis of nutrient content, the government will not be required to fix MRP for urea. To ensure that subsidy reaches the target constituency in full, the government will have to start sending the subsidy directly to farmers’ bank account.” With the government aggressively pursuing that every citizen must have a unique identification card and a bank account, direct subsidy transfer is becoming easy. The Economic Survey conveys the message that the objective of making fertilizers affordable to farmers, particularly the small ones by providing substantial subsidy gets defeated when diversion to industry and foreign markets is as much as 41%. With its retail price fixed here, there is built in incentive to send urea across the border to countries where premiums of over 100% on Indian MRP are available. It goes against the grains of economics that the department of fertilizer will decide every season how much fertilizer is to be imported by canalizing agencies based on its estimate of domestic supply and demand. But fertilizer demand forecasting is a tricky business since it is linked not only to how the weather will behave but also to capacity of farmers to pay for farm inputs decided by their income from the previous season’s crop output and sales. The Survey points out that it will be up to 70 days before urea imports make it to Indian shores once the fertilizer department gives sanctions to buying the material in the world market. This time-consuming practice is the reason why India finds urea shortages getting exacerbated by delayed arrivals of imported materials. The jinx can, however, be easily broken by decanalizing imports. It will be ideal to leave the volume and timing of urea imports to a much bigger number of participants than the present three. Let shortages not force farmers to procure urea in black market in high demand times. The inefficient application of fertilizers over the past many decades has meant that the use of the input is not making commensurate growth in agricultural productivity. The Survey says:“Grain yield per kg use of NPK fertilizer has declined from 13.4kg per hectare in 1970 to 3.7kg grain per hectare in irrigated areas by 2005.” Quite likely the situation has continued to worsen. A bane of Indian farming is that in state after state soils suffer from deficiencies of micro nutrients such as boron, zinc, iron and copper and organic fertilizers. The Survey recommends a “judicious” mix of chemical fertilizers, bio- fertilizers and locally available organic manures to improve and sustain soil fertility. The new urea policies which ushered in uniform gas costs for all urea producers by pooling the prices of domestic and imported gas and extension of subsidy to production beyond reassessed capacity of manufacturing plants have done good to the industry with domestic production in 2015/16 up 8% and consequently urea imports were down 3% year on year to 8.47mt. As local production is expected to improve further to 25.5mt or even more in 2016-17 imports are likely to remain at last year’s level. This is notwithstanding significant improvements in crop prospects in the current year. The majority of Brazil’s fertilizer industry has been sold to foreign companies, and imports are rising as a result, writes Patrick Knight. used if yields are to remain high, was imported. In the intervening years, the amount of soya, maize and sugar cane, among Brazil’s leading export earners, has grown steadily. New areas of land have been opened up, and more rice, cotton and wheat having been grown as well. Demand for fertilizer has risen by an average of 3% a year to the present 30mt (million tonnes). But the amount produced locally has remained steady at about 9mt, falling to less than that in some recent years. Vale has been privatized, and government control of Petrobras has been loosened. The companies were both hard hit by the fall in the world price of both crude oil and iron ore, and facing severe financial difficulties, both have been forced to sell their interests in fertilizer, along with numerous other assets. The US controlled Mosaic company, the world’s largest producer of phosphates, has recently bought Vale’s assets, paying about $3 billion for them, while the Norwegian-owned Yara, has bought most of Petrobras’s assets, which as well as phosphates, include nitrates. Petrobras is a large producer of natural gas, and with numerous deep sea fields being opened up, will soon have much more gas available. But the company itself will not be involved in processing the extra gas into urea and fertilizer. The previously state owned companies are not the only ones to have been sold. The privately owned Anglo-American mining company, hard hit by the fall in ore prices, has sold its interests in fertilizer to the Chinese owned China Molybdenum company. An Indian company, United Phosphates, is to spend $1 billion on a new plant in Brazil. The financial difficulties Brazil has experienced in the past few years have caused the currency, which three years ago, was greatly overvalued, to lose 30% of its previous value. Although this led to farmers getting less foreign currency for their soya beans, meal and oil, as well as their maize and sugar, the price in local currency, in which most costs are incurred, hardly fell at all. So farmers have continued to plant more of these three commodities, and the area planted to them, the leading users of fertilizer has grown by about 2% each year. Although the weaker currency has caused demand for fertilizer to fall slightly in Brazil in the past two years, demand by several other important users of fertilizer has fallen as well, so prices have weakened. In contrast to the state owned companies, the new owners of most of the fertilizer processing and distributing facilities in Brazil, have little interest in attempting to raise domestic production of nitrates, phosphates, or to intensify the search for potassium, large quantities of which are thought to exist in the Amazon region. In common with all large multinational companies, the new owners prefer to import the extra quantities of fertilizer which will be needed by Brazil for the forseeable future. Much of the extra food which will be needed to feed the increasing number of inhabitants in the world, is expected to be grown in this country. Imported fertilizer now costs Brazil about $12 billion a year, and after crude oil and refined oil products, fertilizer is the most costly import. As the economy starts to recover, some efforts may be made to increase local production, and cut the import bill. But this will only happen with government help and stimulus. For the time being, the authorities seem prepared to allow market forces to operate without any restrictions. This is prejudicing the important and influential farm sector, responsible for a major share of Brazil’s export earnings. At the moment, most of the 24mt of phosphates, nitrates and potassium imported by Brazil each year, are unloaded at the ports of Paranagua and Santos, where numerous processing and concentrating plants have been built. The reason for this is that until 25 years ago, the great majority of all the crops planted in Brazil were grown in the south east region. In recent years, however, most extra plantings have been done in the centre west and north east of the country. At the moment, most of the 30–40% of the fertilizer is used on farms in the centre west and north east, which are up to 2,000km from Santos and Paranagua. Most is taken to farms on the trucks which have brought the soya and maize to the ports. Fertilizer provides truckers with a useful ‘return’ cargo, which holds down their costs. But as waterways are opened up in the north of the country, and an increasing number of barges are used to transport soya and maize to ports, more fertilizer is being imported via ports such Vila do Conde and Itaqui. Itaqui is the terminus of the railway which carries iron ore from Vale’s Carajas mines to the sea. But it also links with the ‘north south’ rail line, along which increasing amounts of grains are carried. The amount of fertilizer imported in the north is now growing steadily, and will continue to do so. Most of the extra soya and maize to be grown in Brazil in future years, will be planted in states of the centra west, notably Mato Gross, as well as this in the Matopiba region of the north east. This comprises the states of Maranhao, Tocantins, Piaui and Bahia, all of which have rail links to ports, as there is little or no spare land available in the south east.